For the last two weeks, news media coverage of Central America has focused on "caravans" of Hondurans making their way north from towards the US. The Salvadoran media is closely following the progress of the caravan from Honduras and reporting all the threats being made by US president Donald Trump. Now a similar small caravan has left El Salvador and another one is purportedly forming. President Salvador Sánchez Cerén spoke about migration and the caravans on a visit to Cuba. The Salvadoran president stated that migration was a human right which ought to be respected. He stated further that his government was "totally opposed" to Trump's vision on migration and that Salvadorans were an important part of the US economy. The National Republican Alliance ("ARENA" for its initials in Spanish) is the major right wing political party in El Salvador. Its candidates won the presidency in El Salvador in 1989, 1994, 1999, 2004 before losing to the left wing FMLN party in 2009. The party currently has the largest number of deputies in the National Assembly. For the 2019 presidential elections, ARENA has nominated Carlos Calleja as its candidate for president. ARENA's founder, ex-major Roberto D'Aubuisson, is venerated by the party. So much so that when you visit the ARENA official party website, clicking a link for "ARENA History" delivers you to a page titled "History of Major Roberto D'Aubuisson". His image adorns the party headquarters. The party and D'Aubuisson are inextricably linked. Millions more. El Salvador's Central Reserve Bank reports that remittances have topped $4 billion through September 2018, a 9.2% growth from the year before. More than 21% of Salvadoran households receive remittances from abroad. Slightly less. The US has deported 12,232 Salvadorans in 2018 as of October 19. This is 750 fewer deportations than the same period in 2017. More than 151,000. The number of Salvadorans with pending deportation cases in the US immigration courts. 500 fewer. The PNC reports that that 2018 has had 500 fewer homicides in El Salvador than in 2017. More than 1000. The number of traffic deaths so far in 2018 in El Salvador is 1016, which is 60 more than in 2017. Six. Victims who died as a result of recent flooding rains in El Salvador. 22 were injured. In a ceremony in Rome today, Pope Francis canonized Salvadoran archbishop Oscar Arnulfo Romero, along with Pope Paul VI, and five other saints. The event was attended by as many as 70,000 of the faithful in St. Peter's Square, and was watched by tens of thousands of Salvadorans gathered outside the Metropolitan Cathedral in San Salvador and at Divina Providencia, the chapel where Romero was assassinated. A video of highlights of ceremony from Catholic New Service. 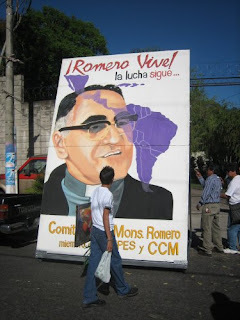 This video offers images of the pilgrimage and vigil outside the Metropolitan Cathedral in San Salvador where Oscar Romero is entombed leading up to the canonization. This video shows the scenes around the chapel at Divina Providencia last night. La Prensa Grafica also offers a collection of images and video of the celebrations in El Salvador. On Sunday October 14, martyred Salvadoran archbishop Oscar Romero will be canonized as a saint by the Roman Catholic Church at a ceremony in Rome. His image is everywhere in El Salvador as the people remember the voice of the voiceless, who walked as a shepherd of the suffering people of El Salvador before his murder in 1980. 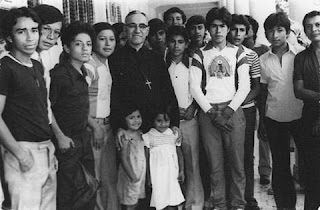 If you have not spent much time with Romero, here are some great resources in English to gain a deeper appreciation for his life and what he meant for the people of El Salvador. The best documentary: Monsenor: The Last Journey of Oscar Romero. This documentary, which was released on DVD last year, offers lots of archival footage of Romero and the remembrances of many people who knew and worked with him. Highly recommended. Mr. Johnson has served the United States Government for over three decades. His career in the Government first began as an officer in the United States Army, retiring in 1998 as a Colonel, and then as a member of the intelligence community. Currently, Mr. Johnson is the Central Intelligence Agency’s Science and Technology Liaison to the United States Special Operations Command in Tampa, Florida. Previously, he was special advisor to the United States Southern Command.The appointment of Johnson would be a variation from recent ambassadors to El Salvador. George W. Bush appointed two wealthy campaign donors, Obama appointed Mari Carmen Aponte, a campaign supporter who became a popular ambassador in the country, followed by Jean Manes, a career State department official.